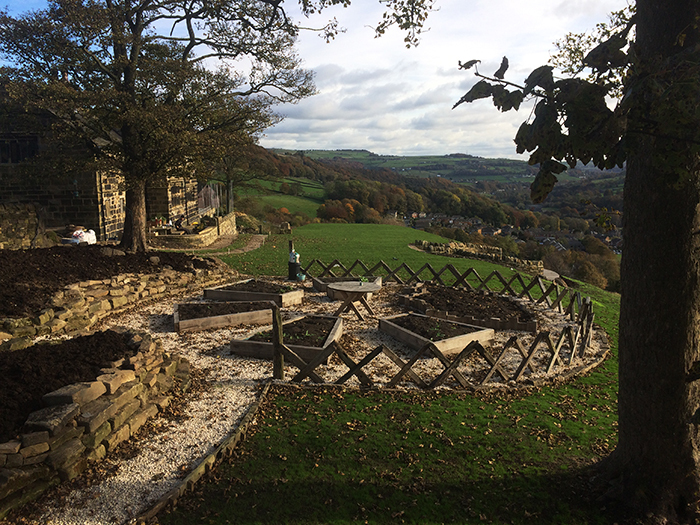 Towards the back end of September we returned to Mytholmroyd to commence phase 4 of works which would focus on bringing the front garden areas close to completion. 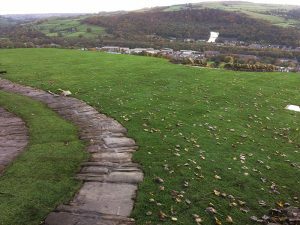 The newly graded half acre bank into the lower field was firstly weeded and a path was carved across the bank to provide access and circulation. Weeding half an acre proved to be a soul destroying ordeal. 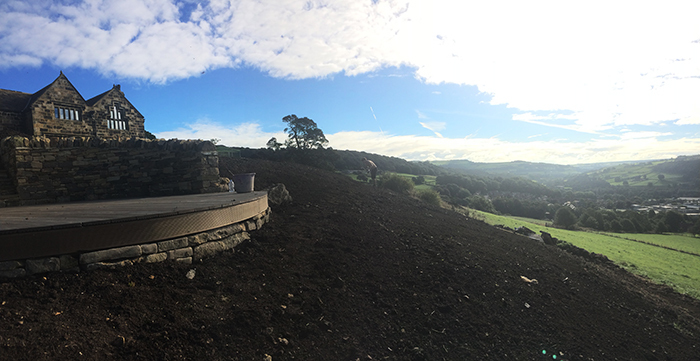 After a final raking over we seeded the bank with a wildflower mix that was carefully selected to suit the aspect, location and exposure of the site. We sourced a 100% wildflower mix from Landlife UK which comprised of Chamomile, Cornflower, Marigold and Corn Poppy to be spread in swathes throughout the bank. The rest of the bank was seeded with Proflora 6 & Proflora 8 sourced from DLF Seed UK which contained 80% grasses and 20% wildflowers. Species such as Teasel were selected to provide habitats for insects, butterflies and bees as well as refuge for some birds. 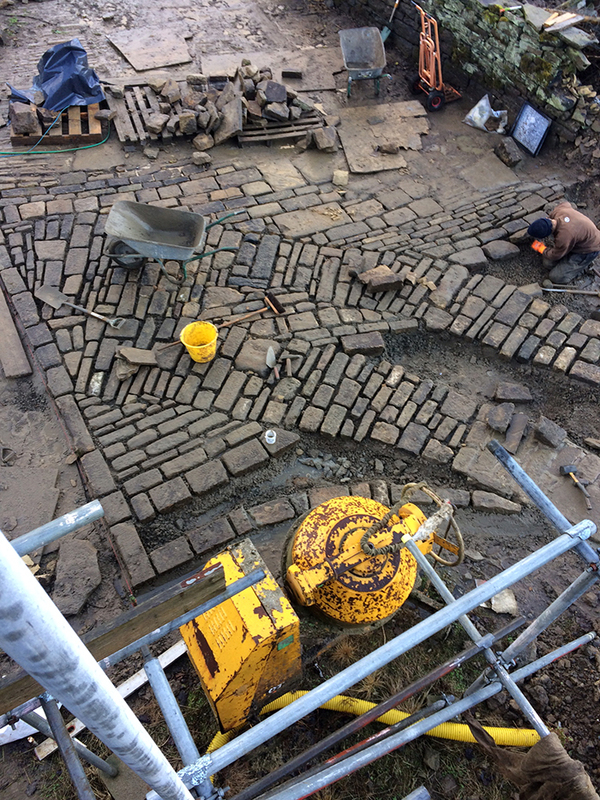 Focus then shifted to restoring the original cobble track that runs through the site and constructing a long sweeping drystone wall that would flank the road and create spatial definition. 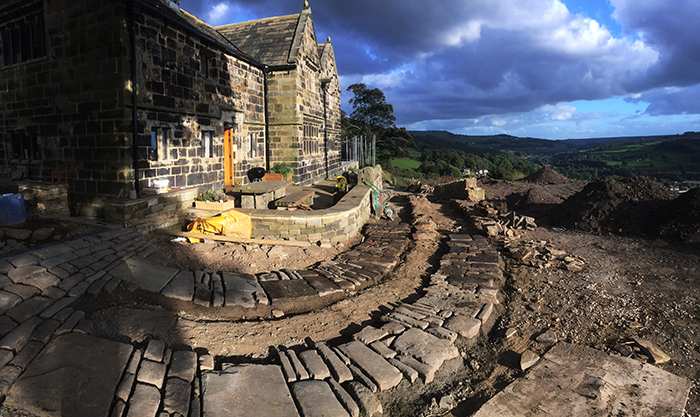 As with all previous phases of work, stone was salvaged from site and we had amassed quite a hill of it. 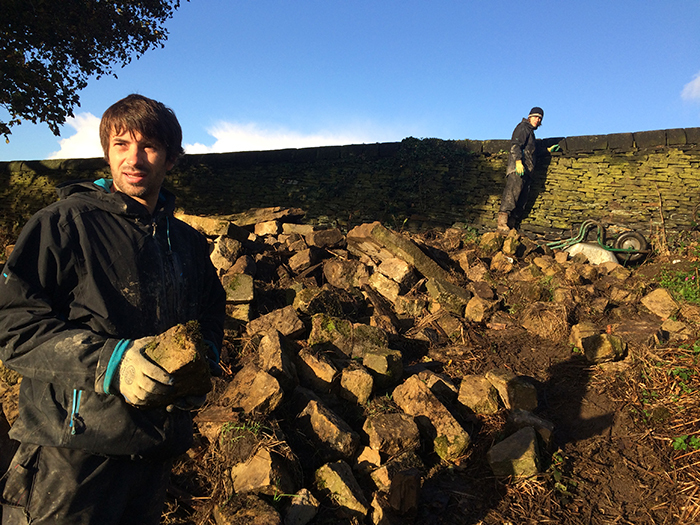 Picking through the stone pile. 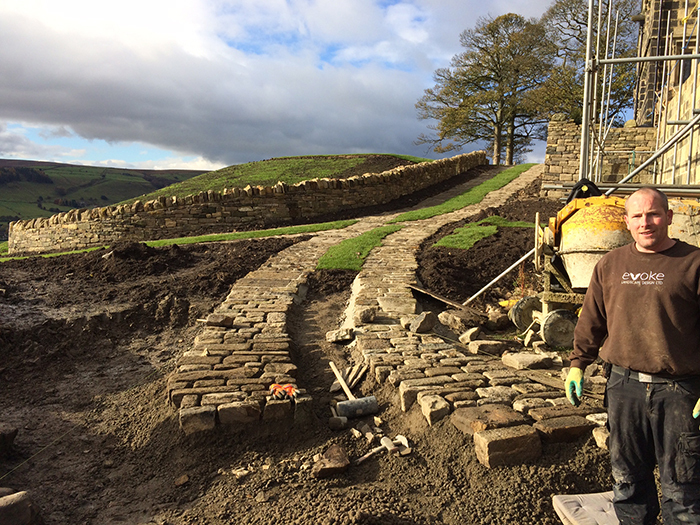 Once the dry stone walling had been completed we begun the lengthy task of reinstating a 90m section of the original cobble road. 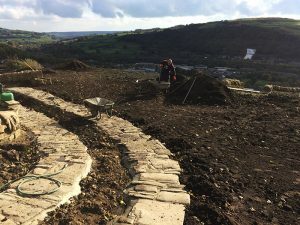 Sections of the road were destroyed during the installation of services to the house so we took the decision to excavate and reuse as much usable stone as possible. Every stone needed to be dressed and pressure washed prior to laying. All in all we mixed over 30 tonnes of concrete to a C20 strength to create a bed of approximately 5-6 inches in thickness making the track suitable for vehicular use. Cobbling our way down the hill. We decided to leave planting beds either side of the track to be seeded at a later date and a central strip of turf. This planting would add some welcome softness to the area. Blending the new track with the original. Completed track with turf infill. A large lawn area to the front of the property would be a major link to the wider landscape having a kind of infinity edge preserving panoramic views from the house. 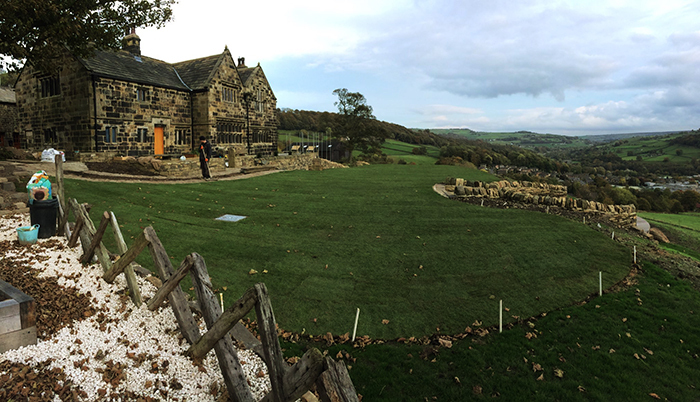 Over 325m2 of Rolawn Turf Rolls were laid in all splashing the site with a mass of green to help sit the harder stone elements down in place. Lawn area viewed over vegetable plot. 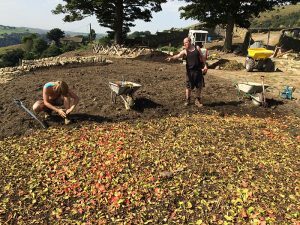 The lawn will become one of the more manicured spots on site and a robust multi-purpose grass seed around the vegetable plot will help to blur the edges a bit and tie in with the wilder surrounding landscape. The final stage of phase 4 was to plant the bank around the pergola and vegetable plot, as well as the beds around the sunken deck area. 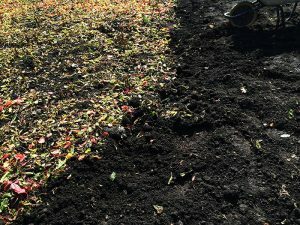 We graded the land and added over 12 tonnes of manure to enrich the soil where planting would take place. Preparing the area to be planted. To create thematic continuity with the planting we echoed a previous grassy scheme adjacent to the area to visually link the 2 spaces. 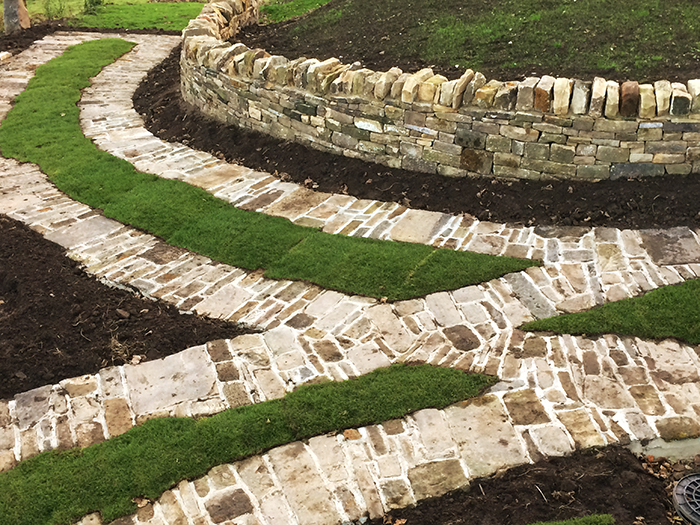 Our principal aim was to really tame a lot of the bold stone elements on site with a mass of softness achieved by using a variety of deciduous and evergreen grasses punctuated with key specimen trees and shrubs. 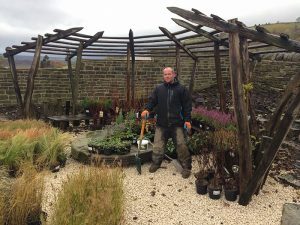 3 multi-stemmed silver birches, Cornus alba ‘Sibirica’ (dogwoods) and a row of Physocarpus ‘Diablo’ would provide structure and backbone with the grasses intermingling and gelling the scheme together. Grasses we used included Stipa ‘pony tails’ for there soft wispy texture and Pennisetum ‘Hameln’ (Chinese Fountain Grass) for its sprays of feathered seed heads. Herbaceous species such as Salvia and Echinacea will provide welcome colouramongst the grasses during the spring/summer months. Preparing to layout the plants. 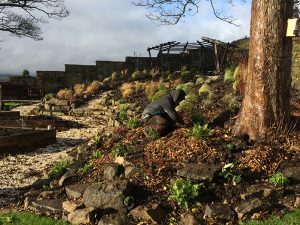 Closer to the paths where people would traffic we added more detail with the planting plugging alpines and ferns into the rockery and planting small clusters of heathers on the meandering gravel path. Allium bulbs were then planted in clusters throughout the area to emerge next season amongst the grasses. Wisterias were planted around the pergola with the long-term intention of engulfing the structure and adding a splash of seasonal colour. The client was keen to grow some espalier apple trees, so we chose a sheltered sunny spot along the rear boundary wall near the pergola and planted 3 varieties of apple. We sourced over 600 plants from Johnsons of Whixley who always supply us with the best quality stock. All in all this phase of works was perhaps one of the most intense and physically gruelling so far, but also one of the most rewarding. We look forward to returning in 2017 to commence phase 5 which may involve the restoration of a listed outbuilding thought to be an old dye house. Watch this space.